Welcome to YYC Smoke & Cigars. We specialize in low-priced cigarettes, cigars, and smoking implements. 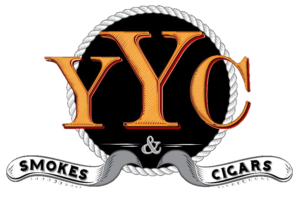 Visit our location for great deals on Cubans and all other cigars, e-cigarettes, e-juice, vaporizers and vape kits, cigarettes, chewing and pipe tobacco, humidors, lighters, ashtrays, and smoking accessories. Featuring a walk-in humidor, low prices, and knowledgeable and friendly Calgarian service. © 2019 YYC SMOKES & CIGARS.